If you are pregnant and overweight, you are more likely to have complications with your pregnancy. However, there are measures you can take before and during your pregnancy to maintain your health and help ensure you have a healthy baby. Gestational diabetes that develops during pregnancy and causes high blood sugar that can affect your pregnancy and the health of your baby. High blood pressure that can cause extra stress on the mother's heart and kidneys which can lead to heart disease, kidney disease, and stroke. Preeclampsia which is a condition that occurs when a pregnant woman has high blood pressure and signs that her organ systems are not functioning normally. Blood clotting problems such as when a clot forms and partially or completely blocks the blood flow in a vessel. A venous thromboembolism is a clot that breaks off and travels to the brain, heart or lung which can cause a heart attack or stroke. Infections are more likely such as urinary tract infections. The possibility of problems during labor and birth which can include possible problems with anesthesia. The possibility that your hospital stay may be longer due to complications from the birth. Complications from caesarian section surgery such as an infection at the incision site or blood loss. The higher the woman's BMI, the risk of stillbirth is greatly increased. Having a sleep disorder such as sleep apnea. Having trouble losing pregnancy weight. When having an ultrasound exam, defects may be missed due to the mother having too much body fat and the baby's anatomy cannot be visualized adequately. The possibility of premature birth. Possible birth defects which can include heart defects, neural tube defects or any health condition that a baby has at birth. Macrosomia which means your baby is large for gestational age. This is when your baby's birth weight is more than 9 pounds, 15 ounces which can cause complications to mom and baby during labor and birth. This increases the chances of needing a c-section as well. The possibility of diabetes, heart disease and obesity for the baby later in life. 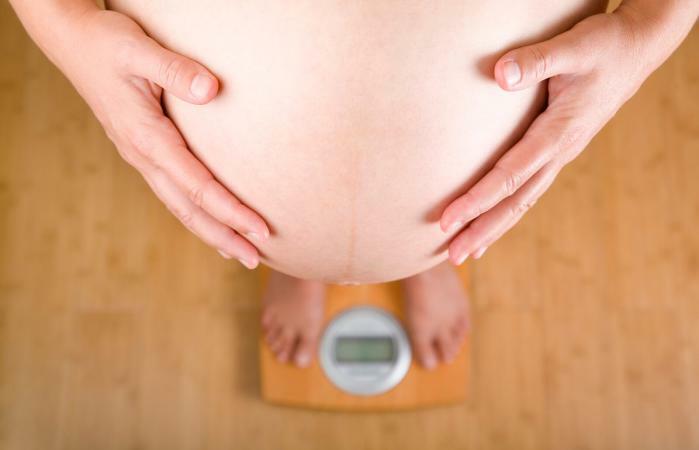 Many people believe obese women should gain at least 15 pounds during pregnancy. The appropriate weight gain for a pregnant obese woman is actually between 11 and 20 pounds. It has been found that when obese women do not gain much weight, it improves their chances of having a healthy pregnancy. Obese women do not have a greater risk of having a spontaneous preterm birth than non-obese women. The risk of an obese woman going into labor for an unknown reason is actually 20 percent lower than a non-obese woman. However, obese women do have a greater chance of preterm birth due to a medical condition such as gestational diabetes or high blood pressure. It is a myth that breastfeeding rates are high among obese women. Actually, breastfeeding rates are poor for obese women. These breastfeeding challenges for obese women include that it may take longer for their milk to come in or they may have a lower production of milk. Preterm birth and the admission of the baby into the NICU may result in a long separation of baby and mom making it harder to breastfeed successfully. Eating 1700 calories a day which is the minimum recommended for a pregnant woman. Avoiding junk food and processed food. Being active or exercising (safely) every day. If you are obese and desire pregnancy, you should always discuss your options with your doctor. It is possible to have a healthy pregnancy and a healthy baby if you do things accordingly. Your doctor may even advise that you lose weight before attempting to become pregnant. This would be good for both you and the baby. Of course, once you're pregnant you should always eat healthily, get your appropriate prenatal care, remain active and always discuss any concerns (major or minor) with your doctor.